Microsoft has released Office 2019 for Windows or Mac to the Home Use Program. Just $15 gets qualifying employees Office 2019 Professional Plus for Windows or Office 2019 Home and Business for Mac. The Home Use Program (HUP) is part of the Software Assurance package for Volume Licence customers. Employees who use Microsoft Office at work, can buy Office for home use at a heavily discounted price. Unfortunately, many companies don’t make the HUP available because of misunderstandings about how it works or the obligations. Alas, sometimes it’s just apathy. Back in 2009 we did a myth busting article on the Home Use Program that helped our readers get the HUP out of their companies. Office 2019 Home Use Program offer is 50% more expensive that the Office 2016 price. Office 2016 HUP was US$9.95 plus tax, it’s now $14.99 plus. Still a great price compared to the $559 for Office 2019 Professional Plus but another sign of how Microsoft discourages people from Office 2019. The Office 2019 Home Use Program is a great price but not as good a deal as in the past. There are important limitations in Office 2019 to keep in mind. There’s a limit of one of each product per employee. That means one Office 2019 for Windows and one Office 2019 for Mac. You can’t install Office 2019 on more than one computer at a time. Unlike Office 365 Home or Personal plans which can be used on multiple computers, Windows or Mac. Office 2019 Home Use Program is ideal if you want just one copy of the same software that you use at work. However, Office 2019 misses out on the latest and greatest from Microsoft. Office 2019 doesn’t have all the features of the latest Office for Windows or Mac that’s available with an Office 365 subscription. Most of the interesting and useful new Office features are NOT in Office 2019. It’s a fixed feature or crippled version of Office. Before diving into the Home Use Program, consider the advantages of an Office 365 Personal or Home plan. Yes, it’s more expensive than the Home Use Program but Office 365 offers a lot more in features, online storage and multiple device access. Office 365 Personal officially costs $70 a year but less if you shop around. 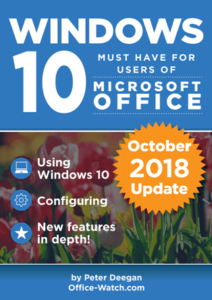 For that you get a better Office for Windows OR Mac with more features AND you can run Office on up to five computers at a time (since the October 2018 licence changes). If your family has two or more people, Office 365 Home is probably better value overall. It’s officially $100 but shop around for at least a $10 discount on that. Office 365 Home can be used by up to six people, each can use Office 365 software for Windows or Mac on up to five computers plus 1TB of OneDrive and an hour of Skype calls to phones.